When editing large text files, you often need to move around between various parts of the files. EditPad Pro's file navigation features enable you to keep a clear overview of your files, and quickly jump to different parts. EditPad Pro's File Navigator gives you an overview of the file you are editing in a collapsible tree. The overview indicates key parts of your files. Those could be headings in a web page, tags in an XML file, news items in an RSS feed, classes and functions in software source code, etc. They can be sorted in the original order in the file, or alphabetically. Simply click on one of the items to jump to it in the file, or Shift+click to select it. The File Navigator also prepares convenient foldable ranges, allowing you to hide parts of the file and make them visible again with just one click. By folding sections under their headers in a web page, nested tags under their containing elements in an XML file, function bodies under their declarations in software source code, etc., you can keep a larger part of the file visible while editing. This makes it easy to move blocks of text around, with far less scrolling. The best part is that the File Navigator can provide this magic for any kind of text file. All it needs is a file navigation scheme. EditPad Pro ships with a large number of such file navigation schemes for many different file types. For many file formats, multiple schemes are provided. E.g. for HTML files, there's a scheme showing just the headings, and another showing all HTML tags. If your favorite file type is not supported, or its scheme doesn't work the way you want, you can create your own fine navigation scheme for that file type. After creating your scheme, you can upload it to this web site (see below) and share it with other people. If you're lucky, somebody else may have already created a file navigation scheme to your liking. In that case, you can simply download and install that scheme. The easiest way to download and install a file navigation scheme is to pick Options|Configure File Types from the menu in EditPad Pro. Go to the Navigation tab, and click the Download button. EditPad Pro will then connect to the Internet and allow you to download and install any scheme with two mouse clicks. Then, the custom scheme will be available in the drop-down list with file navigation schemes. If you cannot use EditPad Pro's built-in download mechanism, you can download the schemes with a web browser using one of the links below. After downloading a .jgfns scheme file, you need to place it into the same folder as EditPadPro.exe. Then go into Options|Configure File Types|Navigation. Click the Refresh button to make EditPad Pro detect the new .jgfns file. Then, the custom scheme will be available in the File Navigation drop-down list in the file type configuration screen. See the list of File Navigation Schemes available for download. Important: The file navigation schemes listed on this web site will work with EditPad Pro 7.x.x and PowerGREP 4.x.x and 5.x.x only. If you are using EditPad Pro 6.x.x, you can download file navigation schemes within the software via Options|Configure File Types|Syntax & Navigation. Older versions of EditPad Pro and PowerGREP do not support file navigation schemes. While many text editors support file navigation and text folding to some degree, they're usually limited to a small set of popular programming languages. None do so in a way as flexible and fully customizable as EditPad Pro. An EditPad Pro file navigation scheme can be made to support any kind of text file. File navigation schemes for EditPad Pro are based on regular expressions. Regular expressions are a widely used pattern language for matching bits of text. By combining multiple regular expressions, you can make EditPad Pro's file navigation schemes lay out and fold any kind of text file with as much or as little detail as you want. No programming skills required! 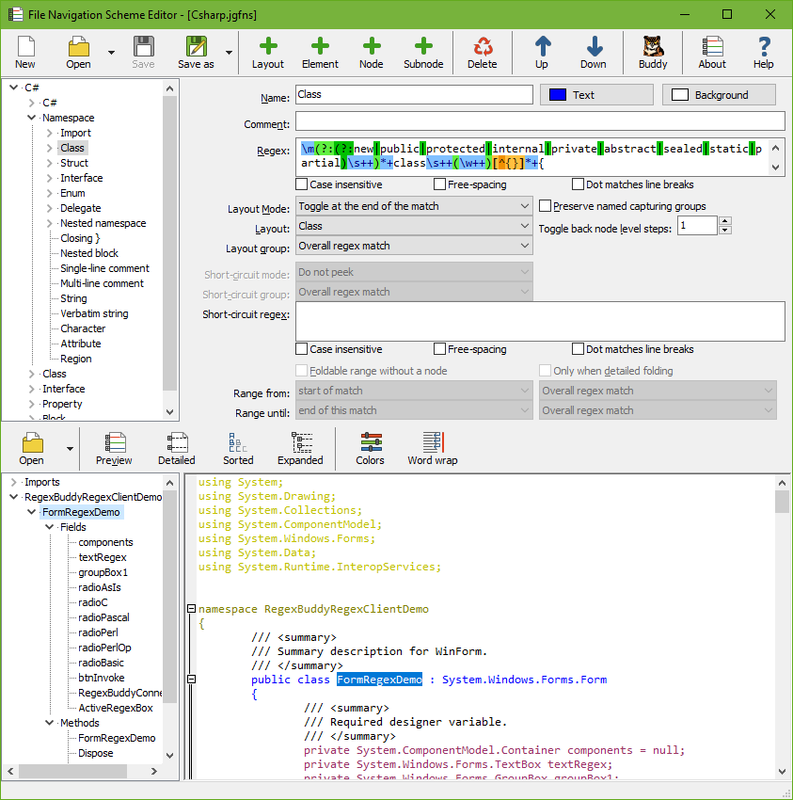 If you are already somewhat familiar with regular expressions, creating a custom scheme is quite easy and straightforward with the JGsoft File Navigation Scheme Editor. If you have purchased EditPad Pro, you can download the scheme editor by entering your email address and EditPad Pro user ID below. 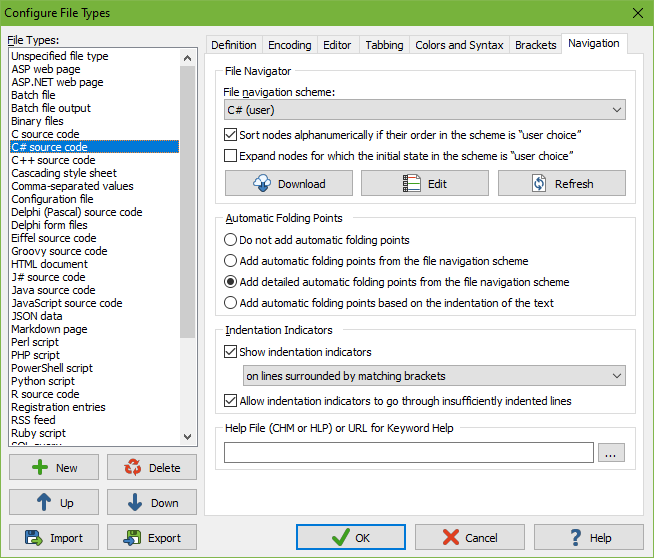 The scheme editor includes full documentation in the form of a help file. I recommend you read through the help file before creating your own file navigation schemes. It contains quite a few tips for crafting useful and efficient schemes. You can use the scheme editor to edit all schemes that are included with EditPad Pro as .jgfns files, as well as all the schemes you've downloaded. The version of the scheme editor you'll get depends on the version of EditPad Pro that your license is valid for. 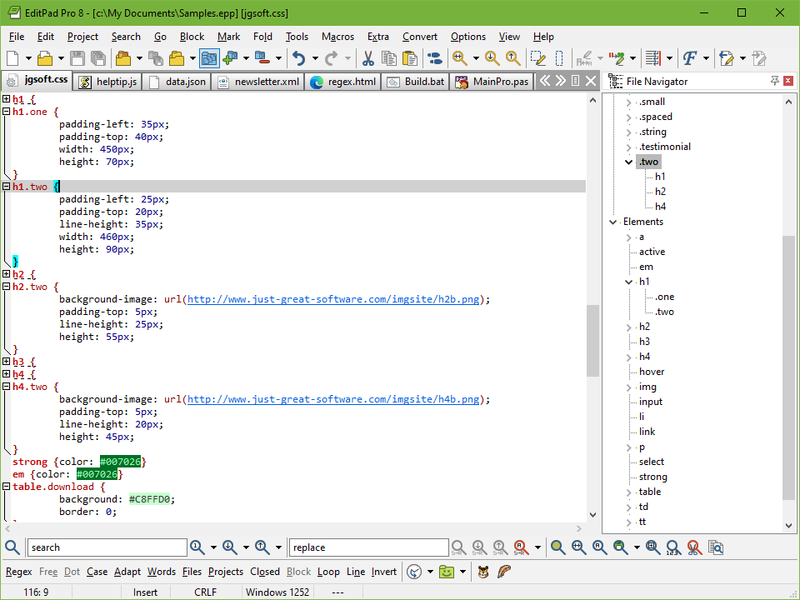 The scheme editor is also available to users of PowerGREP. If you want to make your own file navigation scheme available for download, please enter the complete path to the .jgfns file on your local hard disk below. Your web browser will then upload the file to our web server, where it will be stored and made available for download. Only licensed users of EditPad Pro are allowed to upload their schemes to our web site. Therefore, we ask that you enter your EditPad Pro user ID below, as well as the email address associated with your license. This is the same user ID and email address that you would use to download your fully licensed copy of EditPad Pro. Note that your email address is needed for verification only. It will not be displayed on this web site. If you have updated your scheme, simply upload it again using the above form. The server will notice that a scheme with the same file name was already uploaded by you (you are identified by your user ID). The previous version will then be replaced with the new version. Note that other people will not be able to overwrite your scheme. If they try to upload a scheme with the same file name, they will be asked to rename their scheme and then upload again. If you want to remove a scheme file that you previously uploaded, please enter the file name of the scheme (e.g. MyScheme.jgfns) below. You also need to enter your EditPad Pro or PowerGREP user ID or email address. You can only delete schemes that you uploaded yourself. "Thank you for your support. 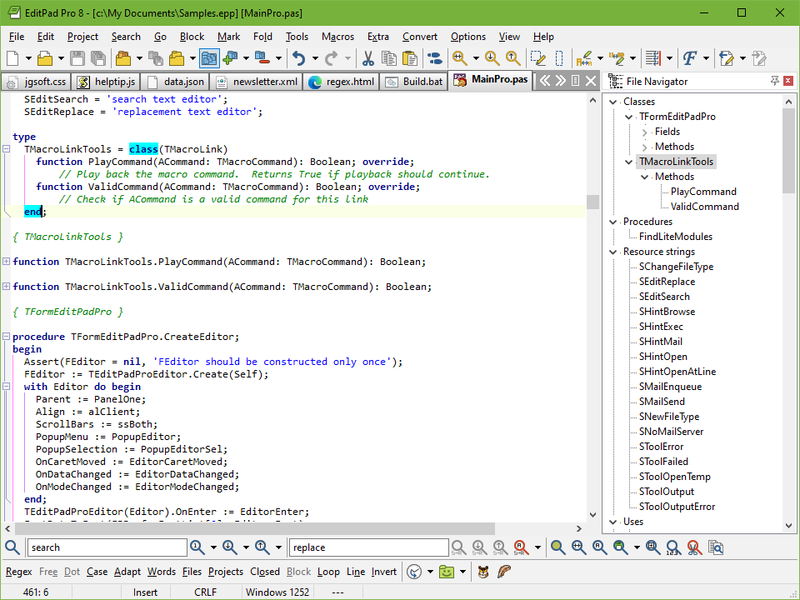 EditPad Pro is the best text editor I have ever used. I recently had our Office purchase 5 copies to be used for our day to day responsibilities of working with big data." "Just though I'd add that EditPad Pro is an awesome tool... I've been fiddling with making my own file navigation scheme for my 'to-do list' text file that all code developers seem to keep :) It's really usefully to be able to collapse the sections I don't have to worry about right now." "I just installed version 6 and I am dancing jigs. Great job! The File Navigator alone is a huge value addition, not to mention the macro support." Copyright © 2000-2019 Jan Goyvaerts. All rights reserved.